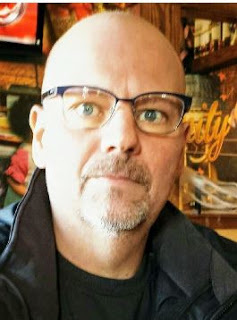 Steven R. “Stevo” INGALLS, 48, of Wellsville, NY, formerly of Canandaigua, died Sunday, January 13, 2019 in Wellsville Manor Care Center. Born April 23, 1970, in Cuba, he was the son of Gary W. and Barbara Halsey Ingalls. A graduate of the Wellsville High School and Alfred State College culinary program, he worked as a chef and owned and operated Soups On Restaurant in Canandaigua. His soups were so good and well known, he was called the soup nazi. He was studying hotel restaurant management at Finger Lakes Community College when he became ill. Steve loved music and spending time with his friends. Surviving are: his mother, Barbara Ingalls of Wellsville; a sister, Jody (Michael) Vannatter of North Bingham, PA; grandmother, Susie Halsey of Wellsville; two step-children, Casey (Jessica) Bloom of Buffalo, NY and Kari Bloom of Canandaigua; two nieces, Adrianna Ingalls and Payton Ingalls; an aunt, Deborah (Walt) Mackney of Andover; an uncle, Gerald Halsey of Wellsville; and cousins. He was predeceased by his father, Gary Ingalls; grandparents, William and Hazel Ingalls and Francis “Buck” Halsey; and brother, Kevin M. Ingalls. Friends may call at Mulholland-Crowell Funeral Home, Wellsville on Saturday, January 19, 2019 from 2:00 – 4:00 PM, with a Memorial Service following at 4:00 PM. The Rev. Carl Kemp will officiate. Burial will be in the Woodlawn Cemetery, Wellsville. Memorials may be made to Allegany County Cancer Services, Attn: Lori Ballengee, 100 South Highland Ave., Wellsville, NY 14895. Daniel F. Slocum, 46, of 3220 Wightman Road, died unexpectedly on Saturday, February 13, 2016 at his father’s home in Wellsville. He was born August 3, 1969 in Wellsville, the son of the late Francis B. and Mary R. (Burgess) Slocum. Dan was a 1988 graduate of Wellsville High School. He was employed at Current Controls in Wellsville for 28 years. He enjoyed hunting and watching football and was a firearm enthusiast. 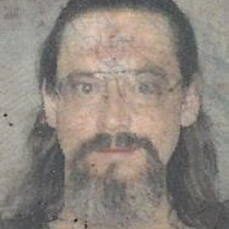 He is survived by a daughter, Trinity Amidon, a sister, Deborah (Jim) Kozlowski, a brother, Francis B. Slocum II, a step sister, Catherine (Tom) Neugent, all of Wellsville, four nieces & nephews, Belinda, Stephanie, April, and James, four great nieces & nephews, Kennedy, Caitlin, Connor and Brockton, two uncles, Howard Slocum and Dale Burgess, two aunts, Carol Slocum and Alice (Jim) Berry, and several cousins. A graveside service for Dan and his Dad; who died December 21, 2015, is being planned for a later date at Stannards Cemetery. The family suggests memorial donations be made to the Wellsville Volunteer Ambulance Corps or the Hart Comfort House. Romona S. Hale, 42, of 4338 Route 275, passed away Saturday (Dec. 31, 2011) at Strong Memorial Hospital, Rochester, following a courageous battle with cancer. Born May 15, 1969, in Wellsville, she is the daughter of Harry W. and Janet Whitwood Hale Jr. On Aug. 1, 2005, in Friendship, she married Tim S. Faircloth, who survives. Romona had resided all of her life in the Friendship area. 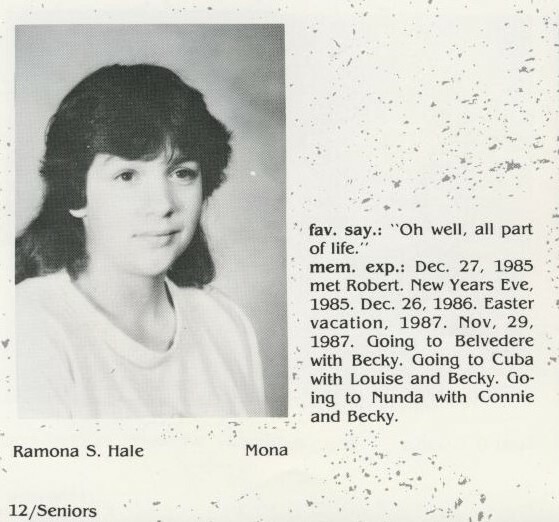 She was a 1988 graduate of Wellsville Central School. She had been employed at various firms in the area including the Friendship Dairies, Miller and Brandes in Friendship and the Bolivar Unimart and had been a CNA at Absolut at East Aurora and Absolut of Salamanca. She loved to cook and bake, especially desserts. She was very good at the computer, but, most of all, loved her family and being with them. Surviving, besides her husband, Tim, are her mother, Janet of Friendship; three sons, Robert J. Hale of Corning, Patrick J. Hale of Friendship, and Timothy J. Hale of Friendship; five daughters, Brittany A. Hale of Friendship, Whittany K. Hale of Corning, Taylor M. Hale of Friendship, Megan M. Hale of Friendship, and Mandi L. Hale of Friendship; four grandchildren, Aryana R., Nevaeh A., Alexiss J.C. and Jesse E.; a brother, Michael T. Hale of Friendship; four sisters, Terri M. (Michael) Walsh of Scio, Vicki L. (Darin) Carlin of Nunda, Judi D. Hale of Wellsville, and Karina L. (Ron) Carlin of Friendship; several nieces and nephews; and a special niece, Jenifer Cawley of Hilton. She was predeceased by her father, Harry W. Hale Jr. Friends may call at the Treusdell Funeral Home, Friendship, from 7-9 p.m. Wednesday (Jan. 4, 2012). On Thursday (Jan. 5, 2012), visitation will be held from noon to 2 p.m. at the United Church of Friendship, at which time (2 p.m.) funeral services will be held. The Rev. Marc Chamberlain, pastor of Genesis Church of Scio, will officiate and burial will be in Maple Grove Cemetery, Friendship. Memorials may be made to the Comfort House of Allegany Co., 141 E. State St., Wellsville, NY 14895 or to Hope Lodge, 1120 S. Goodman St., Rochester, NY 14620.